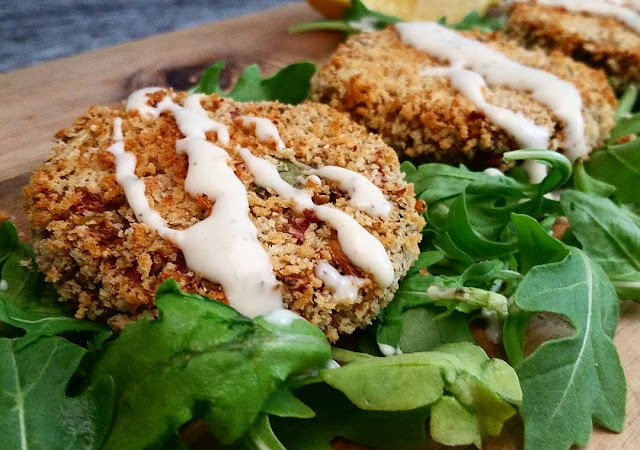 Vegan Crab Cakes have been a popular item on the internet for a while. I remember when we first transitioned to a plant-based lifestyle just over 2 years ago. 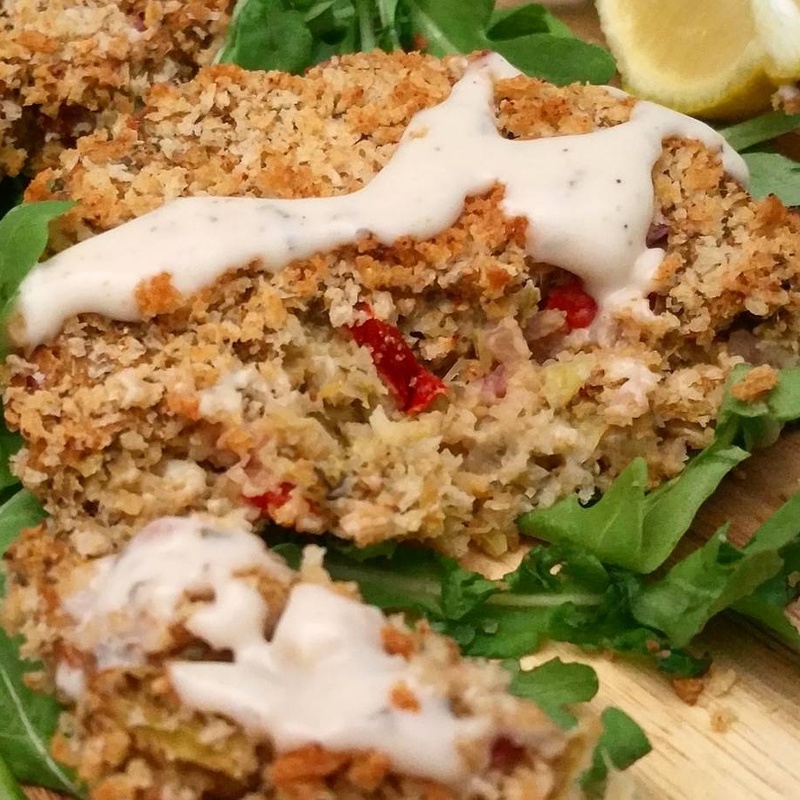 I found Hot for Food blog and saw a recipe for vegan crab cakes made from canned artichokes. It was pan fried and pretty good, but I haven't made them since. I don't find it necessary to fry things anymore and I can't eat fried foods so I come up with way to get that crunch without all the heavy greasiness, that would send me into a digestive pit of pain, and likely knock me out cold, sorry I got carried away. 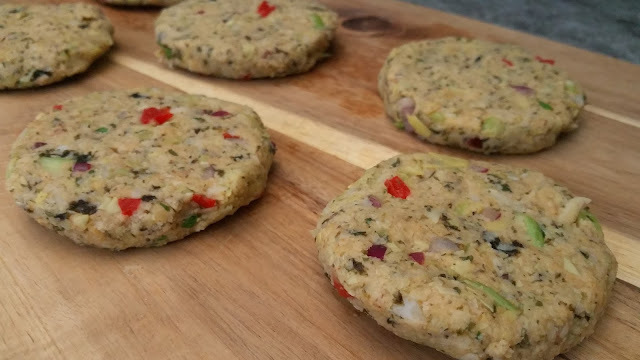 Anyway, I wanted a vegan crab cake with a little more "chew", baked and oil-free, and I could sneak some more nutrition into the kids, and hubby for that matter, ha. So, I looked around Pinterest and found a few made with chickpeas!! You know how I love Chickpeas they are a staple, and ALL my kids love them, so that should speak for its self. Side note if you haven't tried The Best Vegan Chocolate Chip Cookies, pick up a couple more cans of chickpeas and make them, you will not regret it!! I tested a few of the recipes but they all fell a little short, so I decided to wing it, since I have a few different things on hand, I went with it. Oh my goodness they were SO good. The Best Vegan Crab Cake better then crab cakes with crab for that matter. This batch made 12. I was hoping to save a few to see how they held up in the fridge and freezer. They had ALL BEEN EATEN! My picky 16 year old ate 5, that's right 5!! We all wanted more. I made another batch the next day just to see if maybe it was a fluke... ALL GONE, AGAIN! Ethan grabbed 2 before I had the table set. He was not taking any chances, ha! Scarlet was climbing the counter asking "you make, you make, you make?" She wanted them before they were even baked. She sneaks into the kitchen and taste tests with me. I'm happy my family has embraced this lifestyle with me. Thanks guys your the best! 1 sheet Nori (optional) it does add a hint of the sea, it's not super over powering but if you don't like nori it's not a deal breaker. Preheat oven to 400. Line a large sheet pan with parchment paper. 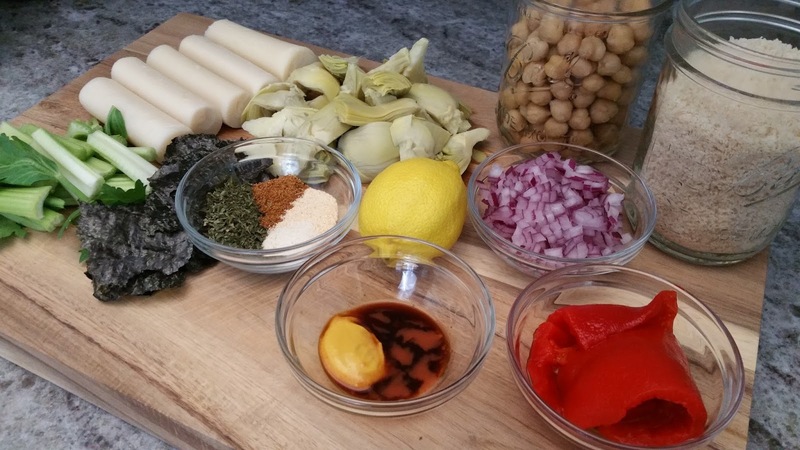 In a food processor add Chickpeas, Artichoke Hearts, and the Hearts Of Palm, celery, rip the nori into small pieces and toss it in to, and the spices. Pulse ingredients until a shredded "crab" type consistency. Then add it all to a bowl along with everything except the breadcrumbs I'd add the breadcrumbs a little at a time. Mix and adjust the seasoning to your taste. You may need to add more bread crumbs if your mixture is too wet. Form into patties this made 12 patties. If they aren';t holding together you can pop them into the fridge for about 10 mins. I didn't need to, but it's an option if they need it. Then coat with breadcrumb coating mixture on all sides. I know it's a lot to ask, but for your safety, and don't ask how I know, you should let me cool for about 5 minutes. You can make a crab cake sandwich, top them on a salad, or just eat the dang thang standing over the stove while your family has no idea you are gobbling up the goodness, but you should share that why they can see how awesome you are at this whole making veggies taste like a delicious plate of goodness, haha! You can totally make a Vegan Remoulade to go on top, I didn't have any cashews on hand so I didn't. This one is topped with Just Ranch from Hampton Creek. Jason and Makayla both agreed it was a good as "sauce" for these. Here's my plate, after I devoured the one secretly, maybe while standing over the stove, burning my mouth off... I squeezed fresh lemon on mine and it was perfect! MAKE THESE, Follow us on social media. If you ever make anything take a picture and tag us on Instagram and Facebook! We love connecting with you! MUCH MUCH LOVE~ Des! Pinterest Definitely let's follow each other on Pinterest. I NEED to see your PINS and get inspired!! YouTube channel Most of my recipes will have a video and What We Eat in a Day videos. Facebook page Facebook hates me and blocks my website pretty regularly so... we have a love hate relationship right now, haha. Here is the recipe video if you're interested in see how I make it. It's helpful to see the textures and the process! Great looking recipe; I can't wait to try it. By the way, you probably mean "stalks" of celery, not "stocks." I hope you get a chance to try it! And yes, thank you for letting me know about the typo. I'm the queen of typo's. Much love! OMG, OMG, these are so GOOD!!! 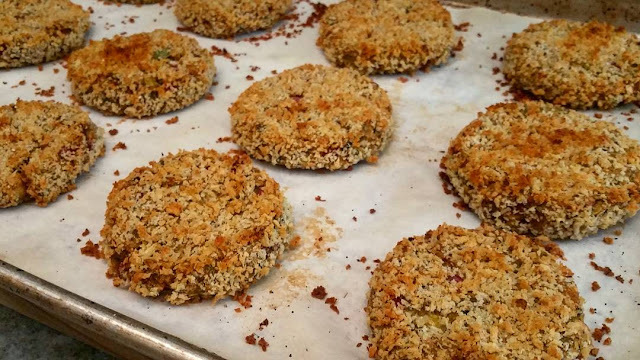 The only change I made (only one, which is huge for me) is I subbed stoneground oats for the panko IN the cakes but I used panko for the coating. Oh, I lied. I made another change — I increased onion and garlic powders to 1 tbsp. So, so, SO YUMMY!!! I made these tonight (new to the plant based world) and my husband (not plant based/vegan) LOVED them. They are so delicious. We are both super happy with them! Now I'm going to look through your page for other delicious recipes! 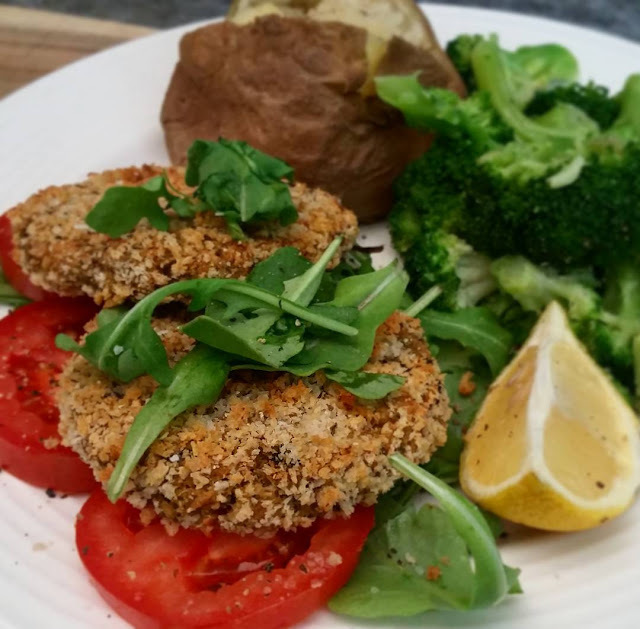 What brand panko crumbs do you use? Thank you! Made these yesterday. Did not like them warm from the oven. Refrigerated them. They are absolutely knock your socks off good on a sandwich with lettuce, tomato and pickle. Wow! By the way, when I tried to go to the plant eater link, a FB message pops up that it is a website impersonating you so it can steal your personal info. You need to do something about FB destroying your reputation.